Everything about this hotel is wonderful. The check in was fast and efficient. Our room was beautiful and the extra touches such as complementary mini bar, prosecco, chocolate, robes and slippers made it so enjoyable. The beds were comfortable and the position of the hotel if second to none was a Costa Coffe only a few shops down. I would definitely stay here again, in fact, I look forward to returning. The only slight downside is that we had a first floor room over looking the city. This was quite noisy and although they do provide earplugs, I think a room higher up woud be preferable. On the whole though I cant recommend this hotel enough. Right from the begining check in was easy . We arrived after 11pm to fruit ,and champagne and compimentary small minibar consisting of water and soft drinks and milk . There were compimentary chocolates too. As we booked a hot tub room with a town square view , The view was amazing by the way , as where the complimentary robes and slippers given for the hot tub use . ,the beds were so comfy i did not want go get up each morning . we booked a ride back to the airport with the hotel to be told we had been upgraded to chauffer rolls royce free of charge i have never felt so looked after . Perfect location. Staff were brilliant from booking to check out, organising everything from airport transfer to tours / trips out and about. To start we organised our transfer to hotel through the hotel, despite our flight being slightly delayed our driver was waiting for us with our Name on a board. Small journey in the taxi to hotel where we were welcomed by reception staff and offered a free glass of Prosecco while we checked in. Very comfy beds, extra pillow delivered to room after a quick call to reception- even a choice of pillow firmness. Soft drink mini bar was excellent with a good choice, lovely touch having Prosecco, fruit and chocolate on our first evening. Spacious airy room, with very modern decor. Jacuzzi bath was amazing and made our trip extra special. Reception staff very helpful, and breakfast at hotel was very good. Shower in the room was very good. And our view over the main square was amazing. Room was warm and welcoming on our arrival. Would definitely recommend and also definitely would come back. Checkout was at 12pm but hotel staff were happy to store our luggage until the driver collected us at 5pm. Awesome location, great price, high attention to detail:customer service. Would highly recommend. 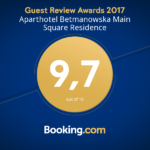 We have just returned from Krakow and stayed here for 3 nights, on our arrival we were greeted by cheerful and helpful reception staff and handed a glass of Prosecco while we checked in. We had a standard double room which was not a big room but I've found this is the norm in Krakow unless you are in an international type hotel such as the Radisson Blu. The room was lovely and spotless, there was a complementary bottle of Prosecco and fruit bowl along with a mini fridge containing soft drinks and a pod type coffee machine which were also complementary and restocked every day. We had not booked to have breakfast but decided we would for convenience, the breakfast was reasonably priced and along side a plethora of cold buffet style breakfast items you can also have bacon and eggs scrambled, fried or an omelette cooked on request and if you fancy it that early in the morning a flavoured vodka or Prosecco. Every member of staff we dealt with throughout our stay were charming and very helpful, I would definitely recommend this hotel and would stay here again. Personalbezogene Daten der Kunden werden an Dritte weder weitergeleitet noch verkauft, es sei denn dass dies gesetzlich vorgeschrieben ist.